Did Anfibra finally elaborated its own breed Standard ? And would it have ceased to be the only specialized and independent dog club in the world that did not have its own breed Standard? Is it really that Anfibra has finally elaborated its own breed Standard ? I hope so… And if it’s true, Uncle Chico will be extremely happy !!! Thus, it was worth it since for more than a year Uncle Chico insistently charge the founders of this club which was the Standard used by Anfibra. As everyone knows, Anfibra affirmed until day-yesterday that the Standard of this club was a “Fila Padrão” that does not exist and the PSC Standard that is nothing more than that elaborated by Dr. Paulo Santos Cruz, by the veterinarian Mr. Rewin Waldemar Rathsam and by the FB breeder Mr. João Ebner in the 1950s and which accepted the so-called “black-fila“. Why does Uncle Chico think that Anfibra has finally woken up, worked and elaboreted out its own Standard after three years of mystery? Why did Uncle Chico receive five emails and WA’s yesterday with this information? And still received a copy of this Standard, stating that this was posted on the face of the largest FB Anfibra breeder, Mr. Flávio Mancilha. So it really seems like it’s actually the first Anfibra Standard. Thus Uncle Chico wishes to congratulate this club that finally after 3 years of many comings and goings, of so much secret and mystery seems that soon will officialize its Standard. So why did Mr. Quinzinho and all the other founders of this club, until then never answer the simple question asked so many times by Uncle Chico: what is the Anfibra Standard ? Why has Mr. Jan Kubesa posted on the Anfibra official facebook on Dec, 28-2016 that uses the CAFIB Standard – even without having a license for such use of a property owned by CAFIB. Mainly because Mr. Jan Kubesa is a Anfibra member and left CAFIB 3 years ago ? What Standard did Anfibra use before this brand new Standard ? 2. Do Anfibra finally recognize that Fila Padrão and PSC Standard never existed? If the Anfibra Standard was only elaborated now, based on which Standard were the Anfibra dogs judged on the expositions already performed? 4. Will the prizes received on these expos by these dogs prior to the release of this brand new Standard have their prizes and scores canceled? Will Mr. Jan Kubesa follow the brand new Anfibra Standard or will he continue to use – even without properly licensed – the traditional and globally known CAFIB Standard developed in 1978 by Dr. Paulo Santos Cruz and the founders of CAFIB? Well my friends, does this new brand Standard posted on this mentioned facebook really belong to Anfibra ? I do not know, but I’m sure I will receive more questions and comments about this possible Anfibra Standard that after three years looks like it was born and appeared. However, for my part for the moment I have only one doubt, reiterating that I did not read this Standard: why was this Standard posted on Jan, 27th-2017 in the facebook of Mr. Flavio Mancilha badly publicized? It reminded me of the last Fila and “fila” Standard of the CBKC, which was also badly publicized, causing a lot of excitement a few months ago. Why was not it first posted on the Anfibra website? After all, is this Standard official? Why so much confusion without necessity? Aleluia, demos Graças ao Senhor !!! Será que finalmente a Anfibra elaborou seu próprio Padrão racial ? E teria deixado de ser o único clube canino especializado e independente do mundo que não possuía seu próprio Padrão racial ? Será mesmo que finalmente a Anfibra elaborou seu próprio Padrão racial ? Tomara que sim… E, se for verdade, o Tio Chico ficará extremamente feliz !!! Sendo assim, valeu a pena durante mais de um ano o Tio Chico cobrar insistentemente dos fundadores deste clube qual era o Padrão usado pela Anfibra. Pois, como todos sabem, a Anfibra afirmava até ontem que o Padrão deste clube era um tal de Fila Padrão que não existe e o Padrão PSC que nada mais é do que o elaborado pelo Dr. Paulo Santos Cruz, pelo veterinário Sr. Rewin Waldemar Rathsam e pelo criador Sr. João Ebner nos idos de 1950 e que aceitava o chamado “fila-preto”. Por que o Tio Chico acha que finalmente a Anfibra acordou, trabalhou e elaborou seu próprio Padrão depois de três anos de mistério ? Sendo assim, parece que realmente trata-se finalmente do primeiro Padrão Anfibra. Assim o Tio Chico deseja parabenizar este clube que finalmente depois de 3 anos de muitas idas e vindas, de muito segredo e mistério parece que em breve oficializará seu Padrão. Então, por que o Sr. Quinzinho e todos os demais fundadores deste clube, até então jamais responderam a simples pergunta formulada tantas vezes pelo Tio Chico: qual é o Padrão Anfibra ? Porque o Sr. Jan Kubesa postou no face da Anfibra em 28/12/16 que usa o Padrão CAFIB – mesmo sem ter licença para tal uso de um bem de propriedade do CAFIB fazendo parte da Anfibra ? Que Padrão a Anfibra usava antes deste ? Quer dizer então que o tal Fila Padrão e o Padrão PSC nunca existiram ? Se o Padrão da Anfibra foi elaborado apenas agora, baseado em que Padrão os cães foram julgados nas expos já realizadas ? Os prêmios recebidos nestas expos por estes cães antes da divulgação deste Padrão terão seu prêmios e pontuações cancelados ? Será que o Sr. Jan Kubesa vai seguir o Padrão Anfibra ou vai continuar a usar – mesmo sem se encontrar devidamente licenciado — o tradicional e mundialmente conhecido Padrão CAFIB elaborado em 1978 pelo Dr. Paulo e os fundadores do CAFIB ? Bem meus amigos e amigas, será que este Padrão postado neste mencionado face é mesmo da Anfibra ? Não sei, mas tenho certeza que receberei mais perguntas e comentários sobre este Padrão Anfibra que depois de três anos parece que nasceu e apareceu. Entretanto, da minha parte por enquanto tenho apenas uma duvida, reiterando que não li este Padrão: por que este Padrão postado em 27/01/16 no face do Sr. Flavio Mencilha foi pessimamente divulgado ? Me lembrou o último Padrão do Fila e “fila” do CBKC que também foi pessimamente divulgado gerando grande celeuma poucos meses atrás. Por que não foi primeira postado no site da Anfibra ? Afinal este Padrão é ou não é oficial ? Por que tanta confusão sem necessidade ? arguments about the property of the CAFIB Standard and the absence of a CAFIB spokesman? your arguments about not doing any new experiments with the so-called “black-fila“? Uncle Chico, see if you agree with me: for me and hundreds of other breeders it does not matter if you are or are not the CAFIB spokesman. What matters to us is what you have over the years clarified, explained and denounced the True History of Fila Brasileiro. What matters is your articles, always accompanied by documents, proofs, photos or facts. And this you do through the 500 articles signed by you since 2009 on the FB, which were all sent by email and then posted on your site ( http://www.filabrasileirochicopeltier.com.br/ ) and on your blog ( https://filabrasileirochicopeltierblog.wordpress.com/ ), along with more than 1500 scanned and posted documents, with more than 1300 photos, as well as books, magazines, newspapers, letters, also digitized that make up the largest World Library on the FB. Thanks to the work of CAFIB and the intense dissemination done by Uncle Chico regarding all problems related to the FB, independent of clubs, I and hundreds of other breeders have the great pleasure to meet and live with the PURE Fila with CAFIB pedigree. In other words, we have escaped being fond of and breeding together with our family members the so-called “mestizo-fila” with its dozens of nicknames and very different types: “stocky-fila, toy-fila, pet-fila, masttiff-fila, neapolitan-fila, black-fila, giant-fila, roitt-fila, bloodhound-fila, docile-fila, hairy-fila, heavy loaded-fila, fila-marques, genetic salad fila” and even the “freak-fila“. And this is the irrefutable and super important fact. The rest is rest !!! Due to this exceptional job done by CAFIB who alone successful rescued the Fila Puro from the extinction, people like Jan Kubesa, Quinzinho and so many others, who have already drank and learned at CAFIB’s forerunner and ever-clear water source, try to steal some assets and part of the CAFIB patrimony by force, mainly of the CAFIB Standard, without at least humbly requesting and without any arrogance its proper and legal license to use. So, I ask you if Jan Kubesa and Quinzinho (Canil Boa Sorte) have already refuted your crystalline arguments in a polite and well-founded manner about the absence of a spokesman in CAFIB and the correct licensed use of the CAFIB Standard without any STEAL of any CAFIB proper. Of course they did not answer me. Because they have no arguments !!! After they both received my emails with my arguments in their mailboxes, they simply disappeared. In fact, as 99.99% of those who attack the Fila Brasileiro, CAFIB and its Breeding Philosophy do. Uncle Chico, I agree with you: it does not make any sense new experiment with the so-called “black-fila”. It seems a simply marketing invention for the sale of dogs in this black color with Pure Fila pedigree issued by CBKC-FCI. Did Andre Coltre, Mariana Dudeck, and Renato Ferreira da Rocha refute your arguments against this experience? Because they also have no arguments !!! Conclusion: As I have said for more than four decades, from time to time, a group of people approach the Fila Brasileiro, make their big mistakes and inventions and then disappear, leaving behind the FB breeding their tracks of destruction. propriedade do Padrão CAFIB e a não existência de porta-voz no CAFIB ? argumentos sobre não fazerem mais novas experiências com o chamado “fila-preto“ ? Tio Chico, veja se voce concorda comigo: para mim e centenas de outros criadores não importa se voce é ou não é o porta voz do CAFIB. O que nos importa é o que voce ao longo dos anos tem nos esclarecido, explicado e denunciado a Verdadeira Historia do Fila Brasileiro. O que nos importa são seus artigos, sempre acompanhados de documentos, provas, fotos ou fatos. Graças ao trabalho do CAFIB e a intensa divulgação realizada pelo Tio Chico a respeito de todos problemas ligados a Raça FB, independente de clubes, eu e centenas de outros criadores temos o enorme prazer de conhecer e conviver com o Fila PURO, com pedigree do CAFIB. Ou seja, escapamos de nos afeiçoar e criar juntamente com nossos familiares o chamado “fila-mestiço”, com suas dezenas de apelidos e tipos muito diferentes: “fila-atarracado, fila-toy, fila-pet, mastifila, napofila, fila-preto, fila-gigante, roitt-fila, blood-fila, fila-dócil, fila-peludo, fila-carregado, “fila-preto”, filamarquês, fila-salada-genética” e até o “fila-aberração”. E este é o fato irrefutável e super importante. O resto, é resto !!! Sendo assim, pergunto se Jan Kubesa e Quinzinho (Canil Boa Sorte) já refutaram seus cristalinos argumentos de forma educada e com muito fundamento sobre inexistência de porta-voz no CAFIB e o correto uso licenciado do Padrão CAFIB sem nenhum FURTO de propriedade do CAFIB. Claro que não me responderam. Porque eles não tem argumentos !!! Após ambos terem recebidos em suas caixas postais meus emails com minha argumentação, simplesmente desapareceram. Aliás, como fazem 99,99% daqueles que atacam o FB, o CAFIB e sua Filosofia de Criação. Tio Chico, concordo com voce: não tem o menor sentido se fazerem novas experiências com o chamado “fila-preto”. Me parece uma nova invenção de marketing para a venda de cachorros desta coloração com pedigree de Fila Puro emitido pelo CBKC-FCI. Será que Andre Coltre, Mariana Dudeck e Renato Ferreira da Rocha já refutaram seus argumentos contra esta experiência ? Por que eles também não tem argumentos !!! Conclusão: como digo ha mais de quatro décadas, de quando em quando, um grupo de pessoas se aproxima da Raça Fila Brasileiro, fazem suas lambanças e invencionices e depois desaparecem, deixando para trás no âmago da criação do FB suas pegadas de destruição. 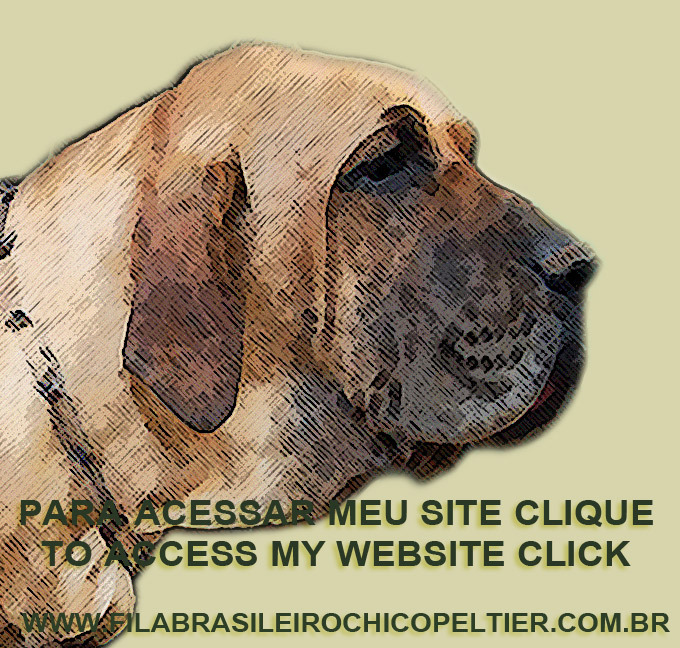 Today I am going to publish a collection of what the Intelligent and learned readers of Uncle Chico think, whose crystalline observations I have received in recent months … These are brilliant observations and generally filled with good sense of humor and that exposes the great disorganization that exists in the Fila Brasileiro Breed. For others, Uncle Chico cannot receive the title of CAFIB Judge Honoris Causa, but the CBKC and FCI judge Alexandre Bacci publicly defends the unbelievable thesis that the FB is not a pure breed dog, but just a group of mongrel, bastards and “mestizos” dogs, can be a judge… Much worse: he is not punished by the omit double CBKC-FCI and their judgments and awards are also not voided… Remembering that Uncle Chico had the sensitivity of valuing the Pure brindle FB, to create the Best FB Brindle trophy especially for FB of this color. The CBKC just issued Circular 0259/17 determining the increase in the rate charged for issuing pedigree registration for FB. Then, why then does not increase the rigor in the inspection of the granting of pedigree records for the FB ? For example: why do not install and make the APR (Apt for Reproduction) and TT (Temperament Test) in theirs expos ? Why do not install and make CLS (Compulsory Litter Survey) before “selling” a pedigree with the very traditional FCI “pure breed” stamp ? Why they are not in fact strict about the requirement of breed purity of the copies to be registered as FB – thus respecting the FCI Statute (see in Article 2, Objectives clicking at http://www.fci.be/en/FCI-Statutes-39.html ) ? Why do not stop any big dogs from being registered as FB? Would CBKC of Sergio Castro or Ricardo Simões and also FCI of Rafael de Santiago, Gerard Jipping and Raymond Triquet have the courage to deny pedigree to a dog, say atypical, and who had been born in the kennels of breeders named Harrison Pinho, Roberto Sene, Marisa Kanap, Andre Bacci, Júlio Soledad, Felipe Xacur Baeza or Carlos Granada ? Or would the possible loss in CBKC billing speak louder? 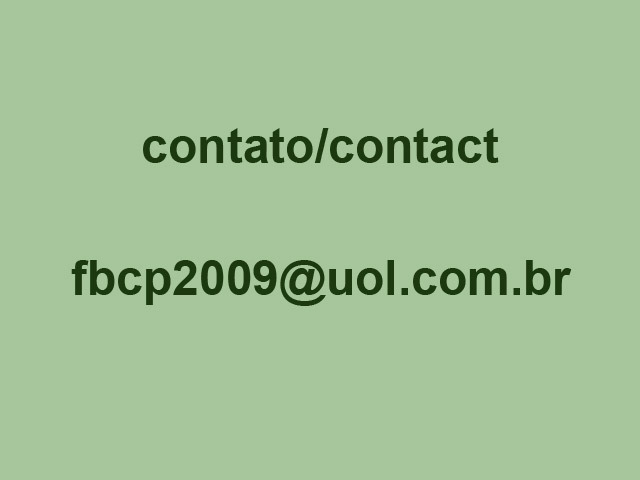 Why CBKC does not immediately accept the “CBKC + CAFIB Partnership Proposal for the Fila Brasileiro” idealized by CAFIB and deliver by this clube on Sep, 10th -2014 that would forever solve the problems of the FB, in the same way as The FCI solved the problem of miscegenation that had occurred since World War II in the Akita Breed from Japan…? Uncle Chico, there are three huge problems in the Fila and “fila” registered in the notary and profit CBKC-FCI System: (i) the register of any big dog as being a Pure FB, (ii) serious and honest breeders from CBKC who owns typical FB cannot impose and organize this breeding and (iii) thus, there is no leadership, not even the traditional-“fila”-breeders because they are not heard and accepted by the majority. At the CBKC FB there is no leadership at all !!! Each one targets your kennel and your personal interests, likes and dislikes about the FB phenotypic. Unlike the CAFIB that always aimed the improvement of its squad and, mainly, the Fila Brasileiro. After all, when facebook “Selection with Ir-responsibility”, will create judgment and finally will have Responsibility…? After all, has the “grenadier” (Granada man…) on duty been able to understand that Uncle Chico, much less CAFIB or Dr. Paulo Santos Cruz, are not and never were responsible for the division of the FB Race? Could this myopic “grenadier” (Granada man…) finally managed to understand that whoever split the FB Breed were, in order: (I) the first FB cross-breeders (ii) the BKC followed by the CBKC-FCI because they agreed to register “mestizos-filas” as if they were Pure FB and (iii) then the NAM `s (Neo Apologists of Miscegenation) who are the heirs of the first cross-breeders who still today breed and reproduce the so-called “mestizo-fila” …? Or does the myopic-“grenadier” (Granada man…) on duty need me to draw him to understand? Very funny, why do not the “fila”-breeders that likes big-and-black-dogs does not breed black Great Dane, black Neapolitan Mastin or Rottweiler? Very funny, why do the “fila”-breeders that likes any-color-big-dogs with a docile temperament, do not immediately breed English Mastiff, Saint Bernard or Great Dane? Some new “fila”-breeders who want to make new “academic” (???) experiments with the “black-fila” – even unbelievably beginning this new experience by crossing it with a yellow Fila – why do not you soon invent a new breed of big-black-dog , with a molosso type and call it Onceiro Paulista, or Onceiro Brasileiro? Very funny, why the group that likes big-black-dogs instead of cross-breeding the FB in the CBKC-FCI System, does not even believe in their own theories and beliefs, and so found their own club and become independent from CBKC-FCI ? CAFIB acted courageously and honestly like this: did not accept the FB miscegenation at the CBKC-FCI System and fell off 38 years ago … Has this group not yet learned the way? Uncle Chico, these people who consisted being against doing things in the right way, always say they love the FB, but deep inside they really like the dogs that are in their families and inside their kennels. They do not like to admit, but the fact is that everyone are avidly to read Uncle`s Chico articles. And they agree with them, but they cannot admit… That’s why you website and blog beat audience records. Congratulations !!! Uncle Chico, is it true that the chubby little Mexicans who threatened to beat you up immediately gave up when they heard and discover that you were 1:85 meters, 90 kilos and a Brazilian Jiu Jitsu purple belt? Reading at your website menu named the Documents 1975 and 1976, I noticed that you, in correspondence with Dr. Paulo Santos Cruz, with copy to Paulo Godinho and Zito Hermanny, already defended the thesis that a group of FB breeders should be created Independent of the old BKC and FCI… Congratulations !!! Uncle Chico, I agree with you: if the Fila Brasileiro was German or English, it would be one of the most popular and beloved dog breeds in the world, as it would have been breed and preserved in a civilized country where a club like CAFIB would be for everyone respected and admired, starting with the FCI itself, which would present CAFIB to the world as an example of a club to be followed and copied. If it were German or English, CAFIB, who rescued this breed from extinction, would be idolized by the press and recognized as a public and ecological utility club. But in Brazil, breed by breeders and controlled by clubs run by illiterate functionaries, this great miscegenation occurred. Outside CAFIB. Uncle Chico, what the Fila and “fila” breeders prefers? Fila by CBKC-FCI ? “black-fila” by CBKC-FCI ? Uncle Chico, for me the coolest thing is that you never “fired first“. You stay in your quiet corner, taking care of your family, friends and work … Then these obtuse functional illiterates write and post nonsense and foolishness, flee from you and the discussion, create parallel issues, do not answer your serious arguments and only then you write your articles as enlightening and ending the controversy with these false prophets of the FB !!! For me you are and always will be “Little Chico Peace and Love”… Full of humor and joy to live … But do not step on FB, CAFIB and your logic and documentation argumentos that you always present in your articles .. . Congratulations !!! Well, my friends, finish here the first episode of this fun collection. observações brilhantes e geralmente recheadas de bom humor e que pintam o quadro da grande desorganização geral que existe na Raça Fila Brasileiro. Isto é, fora do CAFIB…, claro !!! Gozado, para outros o Tio Chico não pode receber o título de Juiz Honoris Causa do CAFIB, mas o juiz do CBKC e da FCI Alexandre Bacci que defende publicamente a esdrúxula tese de que o FB não constitui uma raça, mas sim um grupo de cachorros mestiços, pode ser juiz… Pior: não é punido pela omissa dupla CBKC-FCI e seus julgamentos e premiações também não são anuladas… Lembrando ainda que Tio Chico teve a sensibilidade de valorizando os Filas Puros tigrados, criar o troféu Melhor FB Tigrado especialmente para FB desta cor. O CBKC editou a Circular 0259/17 determinando o aumentou na taxa cobrada para emissão de registro de pedigree para FB. Então, por que então não aumenta o rigor na fiscalização da concessão dos registros de pedigree para a Raça FB ? Por exemplo: por que não fazem APR e TT em suas expos ? Por que não fazem VNO (Vistoria de Ninhada Obrigatória) antes de “vender” um pedigree com o tradicional selo de pureza racial da FCI ? Por que não são de fato rigorosos quanto à exigência de pureza racial dos exemplares a serem registrados como FB – respeitado assim o estatuto da FCI (veja no “Artigo 2, Objetives” clicando em http://www.fci.be/en/FCI-Statutes-39.html ) ? Por que não evitam que qualquer cachorro grandão seja registrado como se fosse FB ? Será que o CBKC de Sergio Castro e Ricardo Simões, assim como a FCI de Rafael de Santiago, Gerard Jipping e Raymond Triquet teriam coragem de negar pedigree a um cachorro, digamos, atípico, e que tivesse nascido nos canis de Harrison Pinho, Roberto Sene, Marisa Kanap, Andre Bacci, Júlio Soledad, Felipe Xacur Baeza ou Carlos Granada? Ou a possível perda no faturamento do CBKC falaria mais alto ? Por que o CBKC não aceita logo a “Proposta de Acordo de Parceria CBKC + CAFIB, em Prol da Raça Fila Brasileiro” idealizado pelo CAFIB e entregue por este clube ao CBKC em 9/10/14 que resolveria para sempre os problemas da Raça FB, da mesma forma que a FCI resolveu inteligentemente o problema igualmente de mestiçagem que ocorria desde a Segunda Guerra Mundial na Raça Akita originaria do Japão…? Tio Chico, são três os maiores problemas do Fila e do “fila” registrado no Sistema cartorial e lucrativo no Sistema CBKC-FCI: (i) registram qualquer cachorro grande como sendo FB Puro, (ii) os criadores sérios e honestos do CBKC que possuem FB típicos não conseguem se impor e organizar esta criação e (iii) assim, não existe nenhuma liderança, nem mesmo dos tradicionais-criadores-de-“fila” pois não são ouvidos e aceitos pela maioria. No Fila-CBKC não existe nenhuma liderança !!! Cada um visa seu canil e seus interesses pessoais. Ao contrário do CAFIB que sempre visou à melhoria e aprimoramento do seu plantel e, principalmente, do Fila Brasileiro. Afinal, quando o facebook Seleção com Ir–responsabilidade, criará juízo e terá, finalmente, responsabilidade… ? Afinal, será que o granadeiro de plantão conseguiu entender que o Tio Chico e muito menos o CAFIB ou o Dr. Paulo Santos Cruz, não são nem nunca foram os responsáveis pela divisão da Raça FB ? Será que este granadeiro-míope finalmente conseguiu entender que quem dividiu a raça FB foram, pela ordem: (i) os primeiros miscigenadores, (ii) o BKC seguido pelo CBKC-FCI pois aceitaram registrar mestiços como se Fila Puros fossem, (iii) e, depois, os NAM`s (Neo Apologistas da Mestiçagem) que são os herdeiros dos primeiros miscigenadores que ainda hoje criam e reproduzem o chamado “fila-mestiço” … ? Ou será que o granadeiro-míope de plantão precisa que eu desenhe para ele conseguir entender… ? Engraçado, por que estes “criadores” de FB que gostam mesmo é de cachorro grandão e preto não criam logo Dinamarquês preto, Mastin Napolitano preto ou Rottweiler ? Engraçado, por que estes “criadores” de FB que gostam mesmo é de cachorro grandão, de qualquer cor e dócil não cria logo Mastiff Inglês, São Bernardo ou Dinamarquês? Estes novos “criadores” de FB que desejam fazer novas experiências de forma “acadêmica” (???) com o “fila-preto” – até inacreditavelmente começando esta nova experiência cruzando-o com um Fila amarelo – por que não inventam logo uma raça nova de cachorro grandão, na cor preta, com tipão de molosso e o chamam de Onceiro Paulista, ou Onceiro Brasileiro ? Engraçado, por que a turma que gosta de cachorro grandão e preto em vez de miscigenar o FB no Sistema CBKC-FCI, não passa a acreditar mesmo em suas teorias e crenças, e assim fundam seu próprio clube e saem da barra da saia do CBKC ? O CAFIB agiu corajosa e honestamente assim: não aceitou a mestiçagem do FB no Sistema do CBKC-FCI e caiu fora 38 anos atrás… Será que esta turma ainda não aprendeu o caminho ? 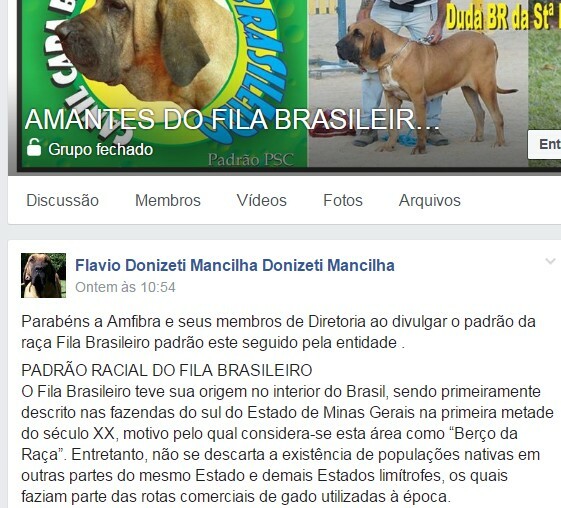 Tio Chico, esta turma do contra — que diz que ama o FB, mas no fundo gostam mesmo é dos cachorros que se encontram no seu convívio familiar e dentro de seus canis — não gosta de admitir, mas o fato é que todos leem avidamente seus artigos. E concordam com eles, mas não podem admitir… Por isto seu site e blog batem recordes de audiência. Parabéns !!! Poxa quanto palavrão te enviaram, Tio Chico !!! Pena que estes analfabetos funcionais não tentem, pelo menos, defender seus errados pontos de vista com um pouco de argumentos e um pouco de lógica… Não sabem nem usar a vírgula… Este correto emprego seria o mínimo..
Tio Chico, é verdade que aquele mexicano gordinho e baixinho que vivia te ameaçando de dar uma surra, desistiu quando soube que voce tem 1:85 metros, 90 quilos e é faixa roxa de Jiu Jitsu ? Lendo o Menu Documentos de 1975 e 1976 do seu site observei que voce em correspondência para o Dr. Paulo Santos Cruz, com cópia para Paulo Godinho e Zito Hermanny, já defendia a tese de que deveria se criar um grupo de criadores de FB independente do antigo BKC e da FCI… Parabéns !!! Tio Chico, concordo com voce: se o Fila Brasileiro fosse alemão ou inglês, seria uma das raças caninas mais populares e amadas em todo o mundo, pois teria sido criado e preservado num pais civilizado onde um clube como o CAFIB seria por todos respeitado e admirado, a começar pela própria FCI, que o apresentaria ao mundo como exemplo de clube a ser seguido e copiado. Se fosse alemão ou inglês o CAFIB, que resgatou esta raça da extinção, seria idolatrado pela imprensa e reconhecido como clube de utilidade publica e ecológica. Mas no Brasil, criado por criadores e administrado por clubes dirigidos por analfabetos funcionas deu nesta grande mestiçagem. Fora do CAFIB. Tio Chico, o que os criadores de Fila e de “fila” preferem ? Fila CBKC-FCI “fila-preto” do CBKC-FCI ? Sabe Tio Chico, para mim o mais bacana é que voce nunca “atirou primeiro”. Voce fica no seu canto quieto, cuidando de sua família, amigos e trabalho… Então estes obtusos analfabetos funcionais escrevem e postam bobagens e tolices, fogem da discussão, criam assuntos paralelos, não respondem seus argumentos e só então voce redige seus artigos tão esclarecedores acabando com estes falsos profetas do FB !!! Para mim voce é e sempre será o Chiquinho Paz e Amor… Cheio de humor e alegria de viver… Mas que não pisem no FB, no CAFIB e na sua lógica argumentação e documentação que voce sempre apresenta em seus artigos… Parabéns !! Bem, meus amigos e amigas, termina aqui o primeiro episódio desta divertida Coletânea. Recebam todos meu muito obrigado. Thank you very much CAFIB !!! I thank my dear friends of almost 40 years of CAFIB, as well as other more recent ones, for once again supporting me against those who spread half-truths or lies and sow discord among the “fileiros” of all Fila clubs. That’s right: as you can read in the CAFIB COMMUNICATION far below, Uncle Chico has never been a CAFIB spokesman and I have said this many times and more recently in my article in English https://filabrasileirochicopeltierblog.wordpress.com/2017/01/03/post-n-448-uncle-chico-newsletter-168-email-sent-last-dec-29th-in-portuguese-directly-to-the-electronic-address-of-mr-joaquim-quinzinho-liberato-barroso-remarking-on-his-r/ dated Dec, 29th-2016. The fact is that CAFIB never had a spokesman. CAFIB signs its own Communiqués. Its members who write their own articles or publish their works, such as Américo Cardoso, Luiz Maciel, Jose Souto Maior Borges, Airton Campbell, Jonas Tadeu Iacovantuono, Cintia and Gerson Junqueira, and as did our dear and beloved Master of Breeding, The Father of the Fila Brasileiro, Dr. Paulo Santos Cruz always signed. We never use the name of CAFIB to spread our thoughts. What unfortunately many do not have the capacity to understand is that because we are a cohesive, united, with a reason for being club and that respects above all the Fila Brasileiro and the CAFIB Breeding Philosophy, we are always in harmony and harmony. While other clubs stumble in their own club clutter and lack of essence. I have been invited to become CAFIB’s Director of Disclosure & Communication a few times, but unfortunately I could not accept this position that would honor me very much, because I dedicate myself too much to my website and more recently to my blog, where I spread my thoughts always with solid arguments and explanations, where in addition to signing my articles, always defending the PURE Fila, the CAFIB and denouncing the miscegenation, the “mestizo-fila” and the omitted authorities. That is, I develop my work independently of CAFIB. So I thank the directors and members of CAFIB who have always trusted me, have always supported me in defending CAFIB Breeding Philosophy and have never censored my articles and my educational work. These articles are consolidated in almost 100 articles of my authorship posted on my site. This site has more than 1000 documents, most of them being scanned from the original documentations and starting in 1942, in addition to having approximately 600 photos posted. My blog today has 450 articles of my own and approximately 700 photos posted. In addition, I am eternally grateful to CAFIB because this club has practically realized my very old dream, since when I found that some breeders were mixing the Fila Brasileiro and falsifying pedigrees in the 70’s, because CAFIB was the only club that rescued from extinction and improve and preserve the Fila Brasileiro as we inherited from Mother Nature !!! Thank you very much, my CAFIB friends. While this has a newly invented club that boasted that it came to revolutionize and innovate the Fila breeding, but that it does not even have its own Fila breed Standard… And its members claim that the CAFIB Standard would be part of such a “… spiritual heritage of Humanity … “, in complete ignorance and disrespect of the Brazilian Law that defends and protects CAFIB from theft and misuse of copyright in our country. I suggest that this new club elects urgently a spokesman because it needs someone to try to justify so much confusion and lack of breed Standard. Informamos a nossos sócios, criadores, expositores, aficionados, amigos e demais pessoas interessadas que o CAFIB – Clube de Aprimoramento do Fila Brasileiro não tem porta-vozes e, quando necessário, emite comunicados por escrito, assinados por sua Diretoria Executiva, como ocorre neste caso. Francisco José Peltier de Queiroz, que integra o Conselho Fiscal, não é e nunca foi porta-voz do Clube de Aprimoramento do Fila Brasileiro – CAFIB, e seus boletins “Tio Chico” e “Perguntem ao Tio Chico”, que circulam pela internet, são inteiramente de sua autoria e responsabilidade, não representando oficialmente o pensamento e as posições do CAFIB, que são definidos exclusivamente por sua Diretoria Executiva, pelo Conselho Técnico Permanente e Vitalício, pelo Departamento Técnico e pelo Conselho Deliberativo Permanente. Quem acompanha o material do Tio Chico ou Chico Peltier, sabe muito bem que ele jamais se intitulou porta-voz do CAFIB, posição repetida diversas vezes em suas publicações, e jamais assinou seus artigos usando o nome do CAFIB. O CAFIB, portanto, repudia qualquer informação em contrário e reitera que aqueles que insistirem neste suposto vínculo estarão faltando com a verdade. O CAFIB esclarece que, como entidade, não participa de discussões supérfluas, inconsistentes, sem conteúdo técnico, muitas vezes equivocadas em relação a fatos históricos relacionados ao Fila Brasileiro e à própria criação, estruturação e organização do CAFIB e à elaboração de seu padrão do Fila Brasileiro Puro, de propriedade exclusiva do CAFIB, como vem ocorrendo na internet e em redes sociais. Quando necessário, para esclarecer fatos e posições, divulgará em seu site oficial, como já vem fazendo, artigos técnicos e relatos históricos para conhecimento geral.